The Research Section assigns highest priority in reviewing manuscripts to rigorous original quantitative, qualitative, or mixed methods studies on topics relating to applications of technology or instructional design in educational settings. Such contexts include K–12, higher education, and adult learning (e.g., in corporate training settings). Analytical papers that evaluate important research issues related to educational technology research and reviews of the literature on similar topics are also published. 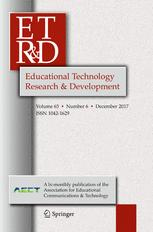 This section features well-documented articles on the practical aspects of research as well as applied theory in educational practice and provides a comprehensive source of current research information in instructional technology. The Cultural and Regional Perspectives Section (formerly International Review) publishes innovative research about how technologies are used to enhance learning and instruction in a culture or region. Educational technology studies submitted to this section should be situated in cultural contexts that critically examine issues and ideologies prevalent in a culture or region or by individuals or groups in a culture or region. Theoretical perspectives can be broadly based and inclusive of research such as: cultural models, technology frameworks, critical theory, and cultural studies. Papers published in this section include quantitative, qualitative, mixed-methods and reviews with a cultural focus. Manuscripts undergo a blind review process involving a panel of three reviewers with initial outcomes usually provided within two months. Instructions for authors are available at www.springer.com/11423.